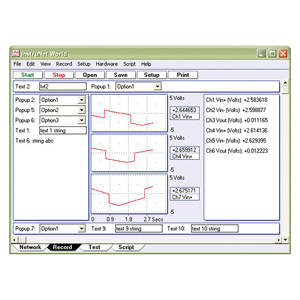 instruNet World Plus is a reasonably priced yet powerful and easy-to-use data acquisition software program for Windows >=XP SP2, Vista, 7 or 8. It enables one to digitize, plot, control, analyze, and save to disk A/D, D/A, and digital I/O data from instruNet hardware. Additionally, it enables one to define their own instrument front panel with buttons, popup menus, edit fields, dynamic text, text editor regions, and waveform graphs. instruNet World Plus is programmed with a simple script language that can define tasks such as control loops. For example, one can type "Dac1 = OnOff (Ain1, 3)" to define D/A #1 as a function of A/D #1.
instruNet World Plus software adds valuable features to the standard instruNet World (not Plus) software which is included with instruNet hardware. Define an analog or digital output channel mathematically (e.g. sine wave, square wave, pulse train, etc) that updates in real-time (e.g. every 100 ms). Define an analog or digital output channel as a real-time function of analog and/or digital input channels (e.g. PID control, on/off control, etc). Create buttons, popup menus, edit fields, dynamic text fields, text edit regions, and pages to build a custom application program. instruNet World Plus Includes Digitize Direct To Excel Software instruNet World Plus includes the Digitize Direct To Excel program, which populates an Excel (Version >= 11.0, Office >= 2003) spreadsheet, (as shown in Figure 2) while digitizing. Create Popup Menus Front panel popup menus allow the selection of one of several choices in a list, as illustrated in Figure 3. One line of script code reads or sets the position of the popup (i.e. 1 refers to the upper-most item, 2 the one below it, etc). The position, label, and list options are easily set. Create Edit Fields Front panel edit fields allow one to select, view and edit segments of text, as shown in Figure 4. One line of script code reads or sets the text in the same way one would read or write to a string variable. The position, label, and initial text are easily set. Create Buttons One can easily create buttons that execute script code when pressed (e.g. "Button 1" shown in Figure 6.) The position, label, and script text are easily set. Create Text Editor Pages In instruNet World Plus, a "page" is similar to a "sheet" in Microsoft Excel. One clicks on a tab at the bottom of the window (note the tabs in Figure 7) to show a different set of front panel items (e.g. popup menus, text editor, edit fields, etc). For example, in a simple case, one might create a page called "Help" that when selected, displays documentation on how to use the instrument. Figure 7 shows 2 user defined pages, labeled "Page 1" and "Page 2", where Page 1 is currently selected and contains a text editor region that shows the text "One can type text here…". Print Waves and Text on Hard Copy Printer Print text and waveforms directly to a printer. Display Time of Day Under Waves Display waveforms relative to the Date and Time of Day. For example, in Figure 8, the first grid corresponds to June 11, 2003, 6:12pm + 31 seconds. Without instruNet World Plus waves are always displayed relative to the start of digitization. Adjust Horizontal Scale While Digitizing A front panel popup menu (refer to Figure 9) adjusts the displayed horizontal scale (i.e. time per plotted horizontal division) while digitizing. In the standard version of the instruNet World software (not Plus), this is set automatically, or via the Record Setup dialog. Copy the Setup of One Channel to Many Channels Setting up many channels manually can be somewhat laborious. instruNet World Plus automates this with a command that copies the setup of one channel (e.g. to a thermocouple, strain gage, etc) to multiple other channels. Digitize in Background While Working in Other Programs Digitize and implement feedback/control loops in instruNet World while working in other application programs. For example, one can type in a Microsoft Word window while instruNet World Plus digitizes and controls outputs. Also, one can minimize the instruNet World Plus window (i.e. click on window title bar upper right corner "_" icon to place minimized instruNet World Plus window on desktop application bar) while it operates in the background. Examine Waveform Values With a Cursor Use the mouse to move a waveform cursor while numerically viewing the time and waveform value at that cursor position, as illustrated in Figure 10.